The Library of Congress Matson collection labels this picture as "Atonement Day crowd. 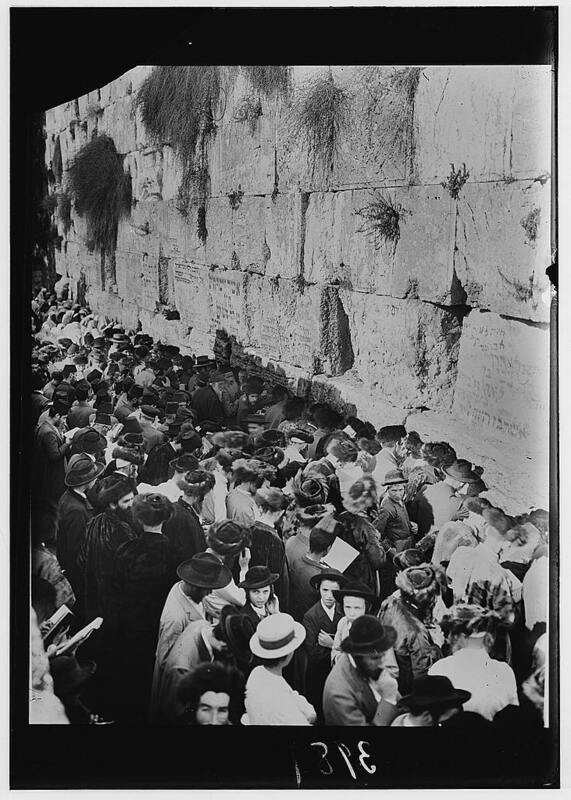 Closer view at the Wailing Wall." As for a date of the picture, the various labels on this picture suggest that it was taken anywhere between 1898 and 1933. What clues does the picture give us? A relatively dark graffiti on the wall -- actually memorials to loved ones-- provides the Hebrew year 5664 which correlates to 1904. The darkness of the writing suggests that it was written relatively close to the time of the photograph. The shadows suggest that the sun is setting in the West, and the Day of Atonement is nearing the end. The worshippers are all men, but it appears that all the way on the left are a number of women with their heads covered. Could they be men with prayer shawls - talitot? Perhaps, but none of the men in the foreground is wearing talitot. Today it is customary for Orthodox men to wear their talitot on Yom Kippur. Has the custom changed in the last century? The hats worn by the worshippers are a mixture of styles: Hassidic fur hats, the non-Hassidic fedoras, the Sephardi fezzes, and the tourist wearing the straw hat "boater." All the worshippers are standing. That rules out 1928 when Jews brought in chairs and screens to separate the sexes. The British authorities overseeing the site moved in, claiming that the Jews had changed the status quo as established by Turkish fiat years earlier. The British forcefully removed the screens, beating some of the women who tried to prevent their removal. They brutally removed the chairs under elderly worshipers. The incident led to protests from Jewish communities across the globe. But the Jewish furniture also inflamed the Moslem leadership of Palestine. Tensions escalated over the next months, leading to the bloody massacres in Hebron and Safad in August 1929.